Cellular Abroad’s MiFi Rental for Italy allows you to create a personal and secure Wi-Fi mobile hotspot with which you can connect up to five devices or users at one time virtually anywhere in Italy, at any time and use as much data as you want. The mobile broadband MiFi device comes preconfigured and ready to go. Just turn it on, enter the password on your smartphone, tablet and/or PC and you are ready to go. 3G coverage is on the Italian network Telecom Italia Mobile (TIM) and is all over Italy including the islands of Sicily and Sardinia. Once you arrive in Italy, simply turn on the MiFi and you will have an instant hotspot. This is the perfect solution for travelers who want secure, instant access to the web at an affordable price. The service includes up to 10GB of service at 3G speeds per any 30 day period. This is more than enough data for 99.9% of travelers. Access Google Maps, stream movies and music, use Skype and check your emails on the go. For more ideas of what you can with your MiFi Rental, be sure to read the reviews by clicking on the “Reviews” tab. 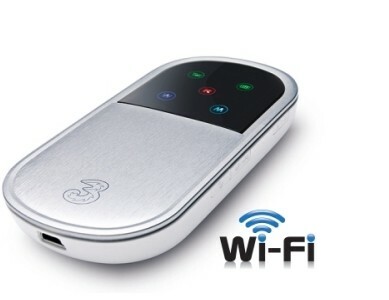 Our MiFi Rental for Italy offers up to 10GB of data at 3G speeds for each 30 days of use. This is enough for 99.9% of all users. Ordering Cellular Abroad’s Italy MiFi Rental is easy. You can order online or speak to one of our expert advisors at 800-287-5072 and they can place the order for you. Time permitting, we deliver the MiFi Hotspot Rental at least 2 business days prior to you departure using USPS or FedEx. We can deliver the following day (except Sunday) for those with immediate departures. The MiFi comes charged and ready to go from the moment you hit the tarmac in Italy. You will receive a fully charged MiFi, complete with a convenient travel pouch and international chargers, a car charger with 2 USB ports (great for plugging in your iPad at the same time and using GPS navigation during your trip), plug adapters and simple instructions. If you have any questions, please call us or email us. The Cellular Abroad Italy MiFi Rental is ready to go. When you arrive in Italy, simply turn it on, enter the password on your device and you are ready to connect to the internet. We will send you a return label with your package. Please retain it and, upon return from your trip, drop off the package at FedEx or USPS(as per instructions) within 2 business days from the last day of your rental period. You can order as far in advance as you like - even months prior to your departure. We will ship your rental at the appropriate date in order for you to receive it prior to your departure. Rentals are shipped ground or express service and will arrive 2 business days prior to your set departure date whenever possible. If you order at least 2 weeks in advance, round-trip Ground shipping is only $12.88. If you are leaving soon, we offer round-trip 2-day Express for $29.96, or Overnight Express for $39.96. We also offer Overnight Priority and First Overnight shipping. What is the latest I can order a hotspot rental? You can order up to one business day prior to your departure as long as you call in before to 1:30pm Pacific Time. Exceptions can be made on a limited basis, even if you are leaving early in the morning - we can usually get your Wi-Fi hotspot rental to you. Please call our 800 number (rather than order via the web) in order to confirm that we can get you a phone rental on time. Does the cell MiFi come charged? Can I charge this MiFi on my trip? Just plug it into the wall. It comes with an Italian plug adapter (which you can use for other devices as well). Alternatively, you can plug it into a cigarette lighter in a car. How do I return the MiFi Rental? No, there are no surcharges or hidden fees. All rental customers are subject to our Terms & Conditions. Can I use the MiFi outside of Italy? The Italy MiFi Rental is intended for use only within Italy. Yes, rental insurance is available for $19.50 as an add-on once you add your item to the cart. See what is covered click here.